Nouar Boldy (Iranian, b. 198x) uses the mononymous identity of Nouar, which is occassionally confused with her online identity of Noir Nouar or NoirNouar. Having been relocated to the United States during childhood, Nouar graduated from the ArtCenter College of Design in 2004 and quickly became employed as a background painter in the television animation industry. By 2006, her fine art work was becoming recognized, its subject matter a joining of Nouar’s love of animation, food, and vintage ephemera. In 2009, she began experimenting with resin reliefs upon her painted pieces, which evolved into her casting sculptures around 2014. 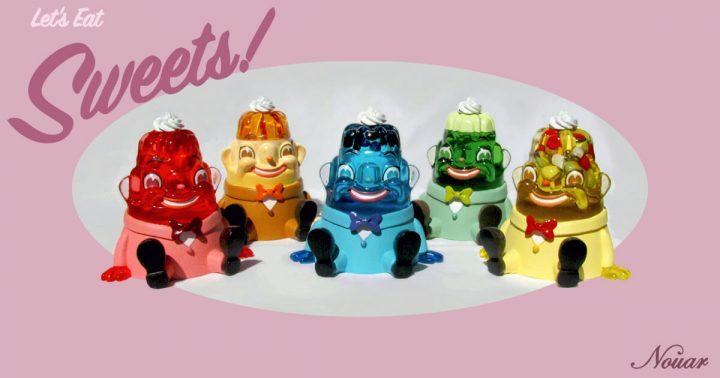 Partnering with Martian Toys, Nouar began issuing vinyl sculptural editions in 2018, specifically Mister Self Indulgence and Lil’ Scoopy.